Last edited by onehundred80; 07-05-2011 at 11:50 AM. This is part# 1122001301 for the SLK32 AMG. I don't know if it's the same as the SRT6 though. There are two types of water pump that look almost identical, one has two outlets and one has three outlets. Make sure you get the one with the correct number of outlets. They have the same casting but the extra outlet is machined out. Checking for parts on a US site they listed the same part forthe SRT6 and the SLK32. They just listed their stock number though. It is of course different from the na and costs 1/3 more. My SRT6 water pump was just replaced with the MB 1122001301 with no problems, that is if you don't consider a hefty chunk of change a problem. An aftermarket pump couldn't be found that would fit. If you want to change your serphantine belt and can't find an aftermarket one, the MB belt is 112-997-00-92. Both MB parts were less expensive and in stock compared to the Chrysler ones. If you've swapped out any pulleys be sure to also replace the water pump idler pulley bearing with an upgraded one. I believe either Needswings or Eurocharge has the bearings. Hopefully a forum member can provide specifics. They do not have the same casting. 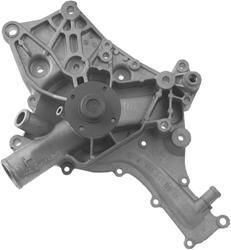 The SRT6 water pump has a shorter and thicker mount for the alternator. The two pumps that are the same casting are machined differently as they will be modified to suit different models. One has two outlets and one has three, you have seen one of them. Does it have two outlets or three? My point was that just looking at various pumps it would be easy to miss the subtle difference. I know the na and SRT pumps are different, in fact the SRT pump is about twice the price of the na. I smell a rip-off. The lowest price for the SRT pump I found was about $280. The lowest price for an na pump I found was a brand new Bosch at $75 and I have it as a spare. I never found a new Bosch SRT pump. NA pumps run from $100 to $180 normally. I bought a N/A water pump thinking I could add a collar to the third port area and save some cash. Like you said, they look the same. After draining the coolant, removing belts, pulleys, etc, I saw the Valeo alternator mount area is very different. This pic looks N/A although LISTED UNDER SRT6. Looks like Rockauto.com has the correct water pump for the SRT6 for $168 US. Last edited by tunaglove; 07-08-2011 at 03:37 PM. my SRT water pump is leaking and growling. I attempted to order it from napa. of course the one they had was not the correct one. Napa wants to rebuild mine with a 2-3 week turn around. i am having a tough time finding the right pump for less than list of $600. and found one for $242 with the core charge. However can anyone tell me if thats the correct pump. i see its listed in the cross reference but i hate to order it to find its not right. anyone actually used the MB number? also if anyone has a good recent source of this pump could you please share the wealth? Ok this has been a real educational experience. The SRT-6 is very difficult to find parts for so after many hours of combing thru parts vendors I have this to offer up. While MB has pumps available they are a bit off the scale on pricing. but then again thats MB for ya. However I have come up with the A1 Cardone parts numbers for this pump. The remanufactured pumps are not available. seems you have to ship your old pump back for rebuild. There are numerous places listing the new pump with a 7 day lead time. My assumption is they have to find them in the supply system and route them to your vendor. the pricing on the new varies from $101 - $200. Most anyone who sells cardone can get them. i have included the pic for the cardone unit. how do you know if it is broken? Simple, you do what they do at the post office with a parcel with a FRAGILE label on it, you keep dropping it until you can hear it rattle when you shake it. It makes a noise because of the failed seal or bearing, and/or it is leaking from the drain hole under the spindle. Just as a heads-up. RockAuto's photos look correct, but they send you the NA waterpump labelled with the SRT6 part #. I tried to get the right one from them twice and had to return them both. I don't think they're trying to mess with anyone, I think that the difference is subtle enough that they're accidentally getting mislabeled. EC 65MM SC Pulley Failure!